3. ^ Frisian (Friesland), Papiamento (Bonaire) and English (Sint Eustatius and Saba) have a formal status in certain parts of the country. Yiddish and the Romani language are recognised as non-territorial languages.[source?] Dutch Low Saxon and Limburgish are recognised as regional languages by the European Charter for Regional or Minority Languages. 6. ^ The United States dollar is the sole legal tender within the Caribbean Netherlands. Before 2011: Netherlands Antillean guilder. 7. ^ The .eu domain is also used, as it is shared with other European Union member states. 8. 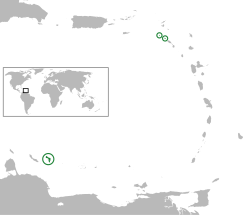 ^ 599 was the country code designated for the now dissolved Netherlands Antilles. The Caribbean Netherlands still use 599-7 (Bonaire), 599-3 (Sint Eustatius) and 599-4 (Saba). The Netherlands is a country in Western Europe. More than 16 million people live there. To the north and west of the Netherlands is the North Sea. To the east is the country Germany and to the south is the country Belgium. 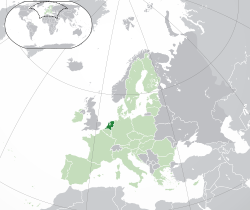 The Netherlands is one of the countries that started the European Union. People who live in the Netherlands are called "Dutch". The language of the Netherlands is also called Dutch. The main capital of the Netherlands is Amsterdam. This however, is not the place where the government is seated. The House of Representatives (in Dutch: 'Tweede Kamer') is in The Hague. "The Netherlands" means "the low lands". The land only rises, on average, 1 meter above the sea level. One third of the land is below sea level. The Netherlands is also called Holland. Holland was a very rich area in the western part of the Netherlands, thus causing people to be mistaken. Some people who do not live in the western part of the Netherlands do not like it when people call the country Holland. The name "Holland" originates from the old Dutch words "Holt land" which means "wood lands". In the 17th century the Netherlands was the richest and one of the most powerful countries in the world. Therefore the Dutch call the 17th century the Golden Age. They had possessions all around the world. The most important possession were the East Indies, a country that is now called Indonesia. The Dutch also founded New Netherland, which is now called New York. The Netherlands often fought wars against other European countries, especially the Anglo-Dutch Wars against England. Michiel de Ruyter, a Dutch admiral, became a Dutch hero when he defeated the English navy close to London. In the 18th century the Netherlands became poorer. Many people thought this was the fault of the stadtholders. Many thought they had too much power and wanted them to get away. In 1789 the French people deposed their king. French armies attacked other countries to depose their leaders too. In 1795 they attacked the Netherlands. Stadtholder William V had to flee to England. The Netherlands were renamed to Batavian Republic and became a democracy. But the French were not content with the Dutch ruler, so in 1806 the French emperor Napoleon made his brother Louis Bonaparte king of the Netherlands. Louis became popular in the Netherlands, but the emperor was again not content with him, so in 1810 the Netherlands became a part of France. In 1815 Napoleon was defeated, and the Netherlands became independent again. The rulers of European countries thought it was a good idea to make the Netherlands stronger, to make them able to resist another French invasion. Therefore Belgium and Luxembourg were added to the Netherlands. William I, the son of stadtholder William V, became king. The Belgians were not happy with the Dutch king. In 1830 they revolted. William sent an army. He was much more powerful than the Belgians but after ten days the French sent an army to support them. In 1831 the Belgians chose their own king and Belgium became an independent country. Some people thought the Dutch king had too much power. They wanted to give him less power and vote for the government themselves. In 1848 there were violent revolts against the kings of many European countries. The Dutch king was afraid the same would happen in the Netherlands. Therefore he allowed Johan Rudolf Thorbecke to write a constitution. From then on people were allowed to vote. At first only rich men were allowed to vote. From 1919 on everyone was allowed to vote. In World War I, the Netherlands did not fight. The Dutch wanted to stay neutral in World War II as well, but in 1940 the country was invaded and occupied by Germany. Just like in other countries they had occupied, the National Socialist Party started to kill Jews. Anne Frank was a Jewish girl who lived in the Netherlands. Her family hid from the Nazis and she wrote a diary. She died in a Nazi concentration camp and her diary became famous. The Netherlands is known for tolerance in politics. The Netherlands is the only country where soft drugs are not entirely considered illegal. Apart from these provinces, Bonaire, Saba and Sint Eustatius are special municipalities of the Netherlands. They are not part of a province, but together are known as the Caribbean Netherlands. Aruba, Curaçao and Sint Maarten are countries within the Kingdom of the Netherlands. In fact a large part of Holland was created by the sand that came from the many rivers flowing through it. Notable Dutch rivers are the Rhine, the Maas, the IJssel and the Scelt. A large part of the Netherlands is below sea level. This is because the Dutch have made many lakes and parts of the sea dry, creating polders. Therefore there is a saying "God created the earth, but the Dutch created the Netherlands." This makes the Netherlands very flat. In the very south-east of the Netherlands, in Limburg, there are some hills. Therefore, this region is a tourist-attraction for many Dutch people. The highest point in the European portion of the Netherlands, the Vaalserberg, is 323 metres above sea level. The highest point in both the Netherlands proper and the Kingdom of the Netherlands is Mount Scenery, on the Caribbean island of Saba, at 887 metres. The Netherlands is a small country; about 300 kilometers from north to south, and about 170 kilometers from east to west. Most people in the Netherlands speak Dutch. In Friesland about 200,000 people speak Frisian. Frisian is the language with the most similarities to English. Some Dutch people speak dialects. The Saxon dialects spoken in the north eastern part of the Netherlands are somewhat similar to Lower German. According to a survey done in 2006, 25% of the Dutch people are Christian and 3% believe in an other organised religion, like Judaism, Islam or Hinduism etc. 26% are 'unbounded spiritual' (have their own beliefs and are not tied to a religion). The other 44% are not religious. ↑ "Wat is het Koninklijk wapen of Rijkswapen? (Google translate)". Official Dutch government website. http://translate.google.com/translate?js=n&prev=_t&hl=nl&ie=UTF-8&layout=2&eotf=1&sl=auto&tl=en&u=http%3A%2F%2Fwww.rijksoverheid.nl%2Fdocumenten-en-publicaties%2Fvragen-en-antwoorden%2Fwat-is-het-koninklijk-wapen-of-rijkswapen.html. Retrieved 8 August 2011. ↑ World Factbook (3 August 2010). "Netherlands". CIA. https://www.cia.gov/library/publications/the-world-factbook/geos/nl.html. Retrieved 14 August 2010. ↑ "GovType". United States Department of State website. United States Department of State. 16 July 2010. http://www.state.gov/r/pa/ei/bgn/3204.htm. Retrieved 5 August 2010. ↑ 5.0 5.1 5.2 5.3 "Netherlands". International Monetary Fund. http://www.imf.org/external/pubs/ft/weo/2011/01/weodata/weorept.aspx?sy=2008&ey=2011&scsm=1&ssd=1&sort=country&ds=.&br=1&c=138&s=NGDPD%2CNGDPDPC%2CPPPGDP%2CPPPPC%2CLP&grp=0&a=&pr.x=40&pr.y=0. Retrieved 6 May 2011. ↑ "Human Development Report 2011". United Nations. 2011. http://hdr.undp.org/en/media/HDR_2011_EN_Complete.pdf. Retrieved 2 November 2011. ↑ "Wet gebruik Friese taal in het rechtsverkeer" (in Dutch). wetten.nl. http://wetten.overheid.nl/BWBR0002219/tekst_bevat_Fries/geldigheidsdatum_25-10-2010. Retrieved 25 October 2010. ↑ 8.0 8.1 "Invoeringswet openbare lichamen Bonaire, Sint Eustatius en Saba" (in Dutch). wetten.nl. http://wetten.overheid.nl/BWBR0028063/tekst_bevat_taal%2Bin%2Bhet%2Bbestuurlijk%2Bverkeer/geldigheidsdatum_01-01-2011. Retrieved 1 January 2011. ↑ "Regionale Kerncijfers Nederland" (in Dutch). Statistics Netherlands. 2007. http://statline.cbs.nl/StatWeb/publication/?VW=T&DM=SLNL&PA=70072ned&D1=224&D2=5-16&D3=l&HD=081103-1603&HDR=T&STB=G1,G2. Retrieved 2007-10-13. ↑ "Bevolking per regio naar leeftijd, geslacht en burgerlijke staat" (in Dutch). Statistics Netherlands. 2007. http://statline.cbs.nl/StatWeb/publication/?VW=T&DM=SLNL&PA=03759ned&D1=0&D2=802-813&D3=0&D4=l&HD=081103-1603. Retrieved 2007-10-13. This page was last changed on 21 October 2015, at 07:09.